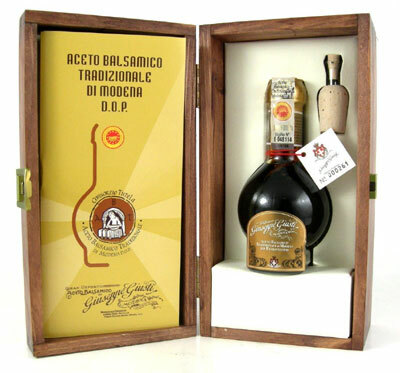 Guiseppe Giusti Gold Seal Tradizionale Balsamico...Renowned not only in Modena, Italy, but also around the world as having the largest collection of rare barrels dating back to the late 1500's, is the "Gran Deposito" of the Giusti Acetia. The Giusti Family has throughout the centuries carefully maintained the collection of barrels in order to balance the celebrated "Giusti Bouquet of Aromas". Proud of its History, today Giusti still produces balsamics of the highest quality. "The vast history of Balsamic Vinegar is the story of Giusti!! !